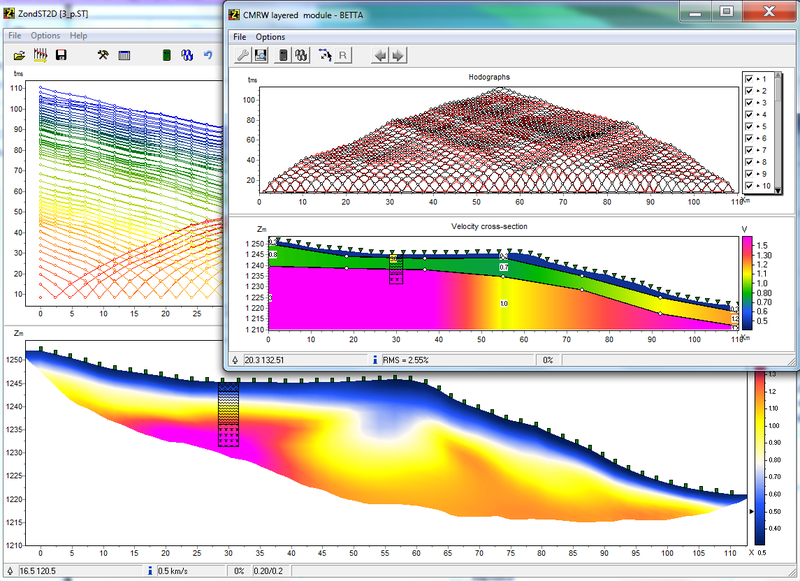 ZondST2d is designed for two-dimensional interpretation of seismic tomography data on refracted and reflected waves (land, cross-borehole and water variants). The software includes the following modules: 1. 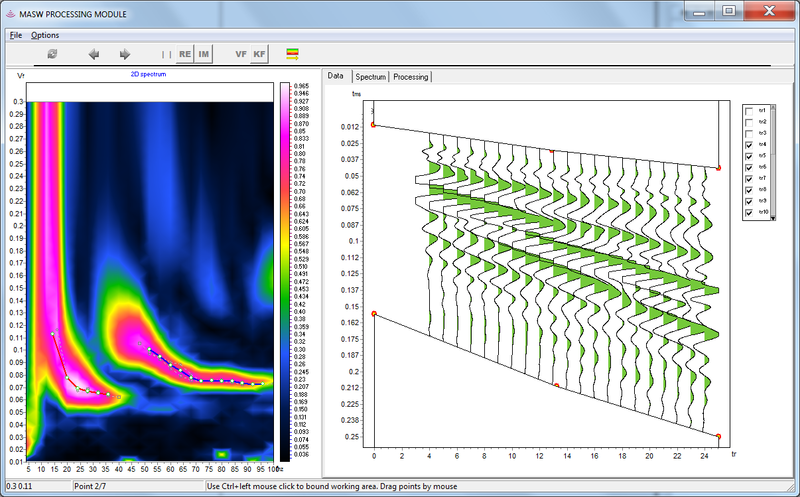 MASW/ReMi – surface waves data processing and interpretation, 2. Refraction waves forward modeling and inversion in arbitrary layered medium , 3. attenuation tomography, 4. velocity anisotropy, 5. Reflection waves forward modeling and inversion in arbitrary layered medium. ZondST2d represents ready solution for seismic tomography, and solves wide range of problems from mathematical modeling and quality control to field data processing and interpretation. Convenient interface and variety of data visualization features allow to solve wide range of geological problems with maximum effectiveness. For the seismograms processing developed a special interface designed to simplify and automate the process of first arrivals times picking. Special attention is paid to variety ways of data visualization and simple access to frequently used functions. Solution of forward problem basis on special ray tracing algorithm of graph theory (Shortest path’s method). This algorithm is characterized by a high-speed calculations, and controlled accuracy. 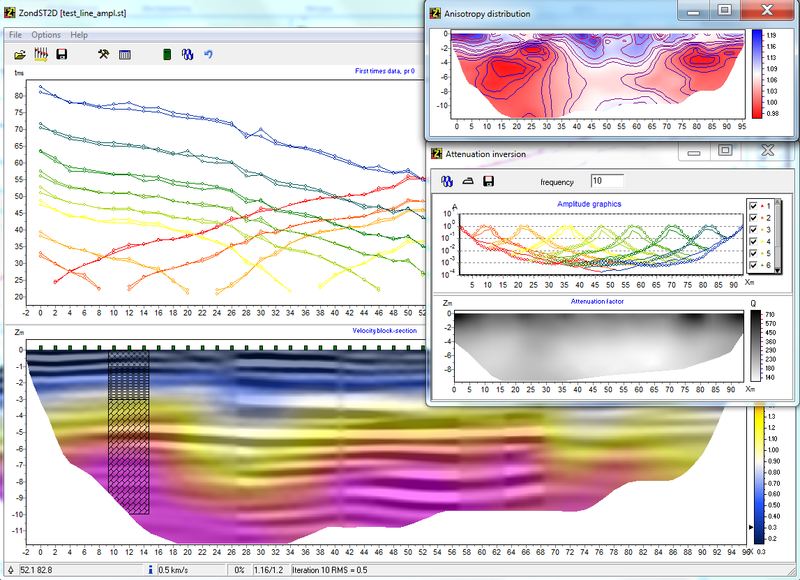 ZondST2d uses simple and clear data format which allows easily combining various systems of observation, including different variants of the topography setting up and other additional information. Important stage which prevents field measurement is mathematical modeling of velocity structure for seismic tomography survey. Modeling gives a chance to estimate the level of reflected waves first times and to make a choice of optimum parameters of the observation system for decision of formulated geological problem. 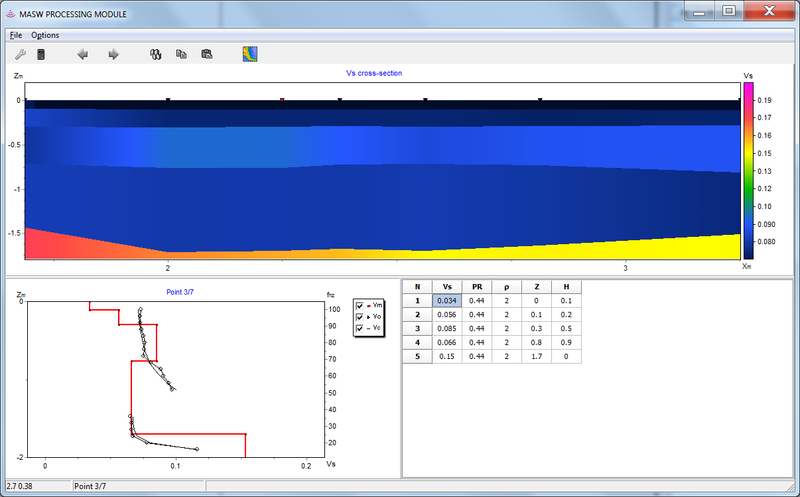 ZondSt2d has great range of tools for mathematical modeling and analysis of refracted and reflected waves. As the general task of the program is inversion of velocity parameters, some variants of seismic tomography inverse problem solutions are designed in ZondST2d, basic of them are: smoothing inversion – to get smooth model and focusing – to get piece-smoothed model of velocities with depth. While program was designed special consideration given to a priori data accounting. Because of equivalence of inverse geophysical problems, quality of the obtained results strongly depends on the amount of a priori data used. In ZondST2d there is possibility of weights setting for measurements, fixing and limits making of changing features of different cells, using of a priori model as reference in inversion. The robust schemas of noise estimation are designed in the software. There is also possibility to import and display results of measurements by other methods and boreholes data that improved quality of results. Four ways for specifying topography. Real-time editing. A set of tools for mathematical modeling of velocity section. Standard mesh “bitmap” style, arbitrary layered model and polygonal style model. Additional tools for gravity, magnetic forward modeling and for joint inversion(Vp&VS, MASW, reflection and refraction, TDEM, VES, gravity and magnetic). Number of the inversion algorithms : smooth, focusing, robust, block. Setting the reference model for the inversion. Suppression of the noise component during inversion (robust reweighting). Number of variants for data, model and apriori information visualization. 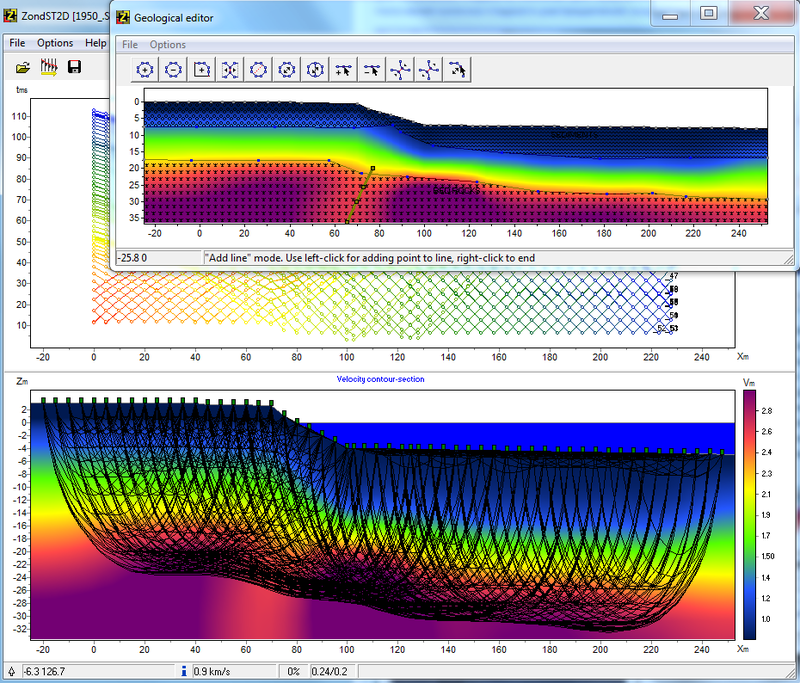 Ability to set a semitransparent background for the resistivity section (geological, seismic sections). 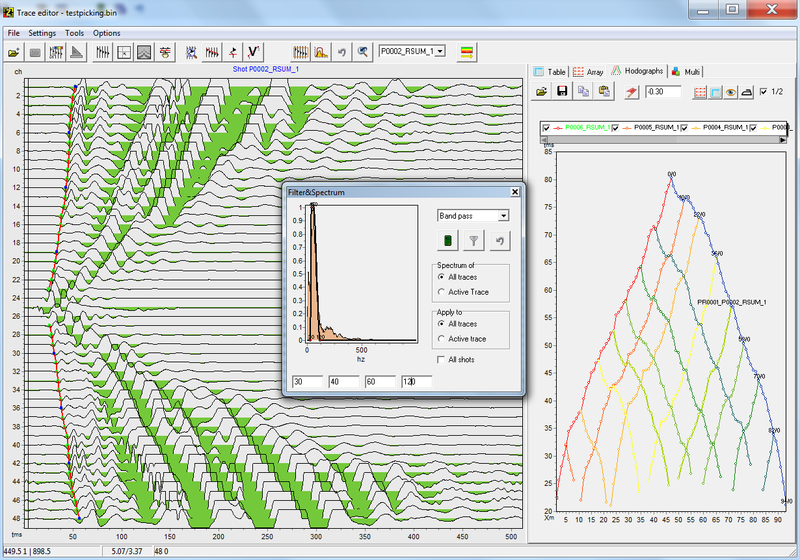 Three-dimensional visualization of the velocity sections along arbitrary system profiles. Maps slices of parameters for various depths.